Taking a break after 60km for lunch. Ray drying out some gear while Paul goes to order more food. There was a smell of Jasmine in the air … a good smell. 1)finding the nearly impossible route out of Belgrade which involved a lot of pantomine with non-English speaking Serbians, eventually finding English speaking Serbians who didn’t understand why someone would want to bike to Romania. 2)Biking in the light rain in the early morning which was not bad but we were drenched and frozen by torrential downpours for the last 40km. There was even hail for a short time. The rain was coming down at about a 45 degree angle directly into our faces. We were far from any shelter biking across rolling grassy fields and there was lightning. 3)the euro velo 6 route we are following has had real trouble finding a good way out of Belgrade so the route has been changed but not the English guide book (that I wish I had a hard copy of). This greatly frustrated a couple of other cyclists that we met that had really depended on their guide books. Since we only have scanned images on my IPad, we are close to lost most of the time so it was not so bad for us. What was bad was being on rutted, muddy dirt track on top of a levee for about 30km. That was very challenging. We had a good ride today. It was 10C when we left this morning so a little cold. 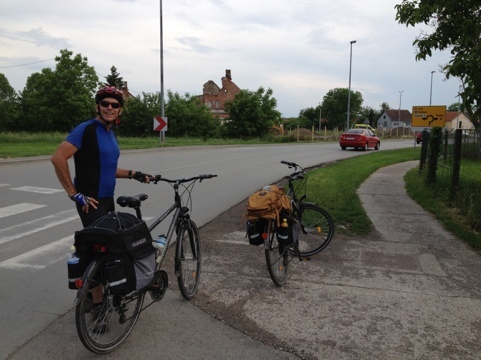 There were some good climbs and nice stretches along the Danube. The highlight of the day was meeting a bunch of Serbian sixth graders. Ray signing autographs for the young kids. … just want to make the world dance, forget about the price tag … So far, we have used Hungarian Florins, Croatian Kuna, and Serbian Dinar (named after a Flintstone’s character, no not Wilma). Mix in some Swedish Krona, some European Euro, Thai baht, and US dollars … let us just say that the wallet gets a little messy. Now we do have a couple of countries left on this adventure, so the situation will get worse before it gets better. We are making heavy use of Paul’s iPad and iPhone to negotiate this journey. There are a few other cyclists out here doing the route, and yesterday we passed about a dozen of them. A French couple offered us chocolate, and we did not decline that generous offer from Belgium. Note that we have inserted a few photos in earlier blog entries. Inserting the photos is not a trivial process, but you may want to check back for photos of the route, landmines, and coke-a-cola. We left Croatia yesterday. What we thought was 20km turned out to be 40km. We had no trouble with the border crossings. After entering Serbia, we did a bunch of small 8-10% climbs. The descents would have been tricky in the rain. Speaking of rain, the last part of the day (80km) was rainy. We were soaked by the time we arrived at a hotel in downtown Novi Sad. Current weather is sunny, as we about to head off to Belgrade. 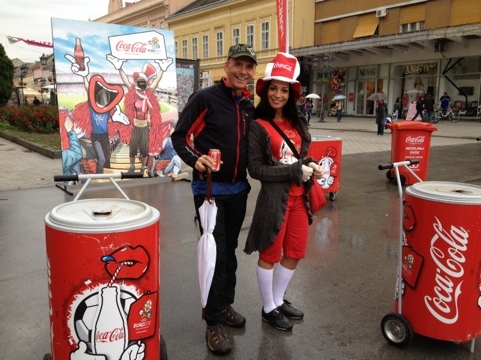 They were handing out free cokes in one of the Novi Sad squares. Ray took advantage of that situation. Today we put in another 135km day. Somehow we managed to avoid any thunderstorms, but they were in the area. A couple of times we rode hard to try and avoid them, and we were successful. If luck is on our side, we will make it into Serbia tomorrow. I should mention that our route has been very entertaining. We are frequently riding on difficult roads … grass, mud, dikes, roads under construction, and so on. Today one road was closed completely. But, we carried our fully loaded bikes over a ditch to join the “closed road”. We also had several small climbs today. The road signs list the gradients of the climbs. The steepest one was 10%. We hit a new maximum speed of 42.6km. 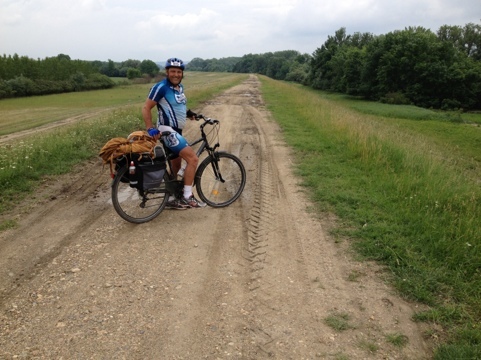 Tomorrow we expect more single-track dirt roads along the Danube dikes. We have seen several other riders out here, and the ones who we have talked to thus far are from Germany. We will keep the blog updated as much as possible. Pauls iPad is helping us out tremendously with route planning, but it is difficult to type much on that machine. We miss family and friends!